Departure Points: Marseille and Toulon. Other departure points available, inquire. Our Provence Private Tours Include: Private transportation and English speaking tour guide, taxes, tolls and parking. 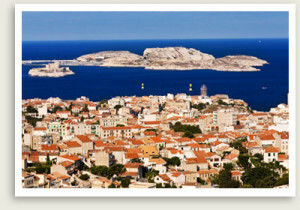 On this privately guided tour you will discover one of the most important and ancient cities in France: Marseille. This city, designated as the European capital of culture in 2013 was built up by the Phoenicians around 600 BC then taken over by the Greeks in 540 BC, and conquered by the Romans two thousand years ago. This 2,600-year-old port is packed with sites and artifacts of antiquity. The town was known for centuries as the “Gateway to the Orient” because of its trading relations with the Middle East and North Africa. It’s a cosmopolitan, exotic and vibrant city, and you will visit its heart — the port – followed by the oldest neighborhood in Marseille, Le Panier, with its narrow streets, squares and colorful façades. The neighborhood is also home to Saint-Victor Abbey, a very important place for the first Christians in Marseille, and Notre Dame de la Garde, a hilltop church that protects the people of Marseille – and offers an unforgettable view over the city. A recent addition to Marseille is the MUCEM Museum, designed by the local architect Rudy Ricciotti, and the Saint John Fortress. After a great lunch enjoying a local specialty called bouillabaisse, you will drive to your final destination, quiet Cassis (French for currant). This little fishing village inspired such artists like Dufy, Signac and Derain, and continues to inspire visitors today. You can relax sitting at a café near the port, watching the fishermen and street artists. Here you can also take a boat ride to admire the beautiful Calanques, little fjords with high limestone cliffs. Your private guide will drive you to the top of Cap Canaille, one of the highest seaside cliffs in Europe with outstanding views of the Med and the Provencal countryside. Contact Well Arranged Travel for other custom private tours from Toulon and Marseille.